Clamps or binders are the simplest and cheapest way of hanging large sheets in an orderly way. Sheets are hung vertically. Lightweight and fully portable, the PlanHorse Plan Clamp is made of extra strength extruded aluminium. Ideal for site work and frequently accessed plans/drawings an entire project can be carried in one clamp. Groups of drawings/sheets are organised and clamped in an orderly manner. No more - Rolling, Folding up, Dis-organisation or damage to drawings. No crimping, slippage or creasing occurs to the contents. The handle makes carrying easy. Rounded corners eliminates scratching desks or tables. Clamps hang in Mobile Trolleys or on Wallmounts. Clamps carry a 10 Year Replacement Guarantee when used for the purpose intended - holding drawings and large format paper. 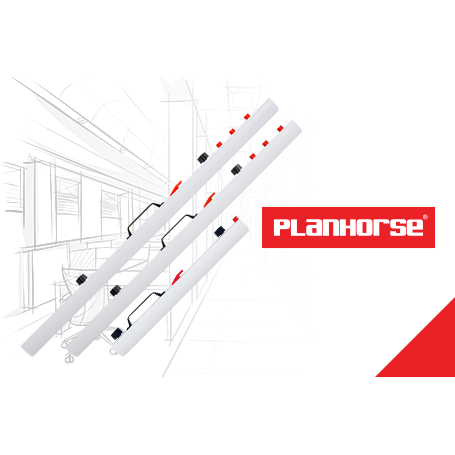 PlanHorse Plan clamps come in 3 sizes AO, A1 & A2 - see Specifications. Clamp design eliminates slippage. Continuous even grip over the length of the clamp produces maximum hold. Clamps are spring-loaded, store sheets flat, do not crimp, fold, tear or crease the sheets. Clamps are simple to use - loosen wingnuts slide sheets in or out then re tighten finger tight. Contents of clamps can be used like pages of a book. Sheets held securely in proper sequence for easy reference and storage.